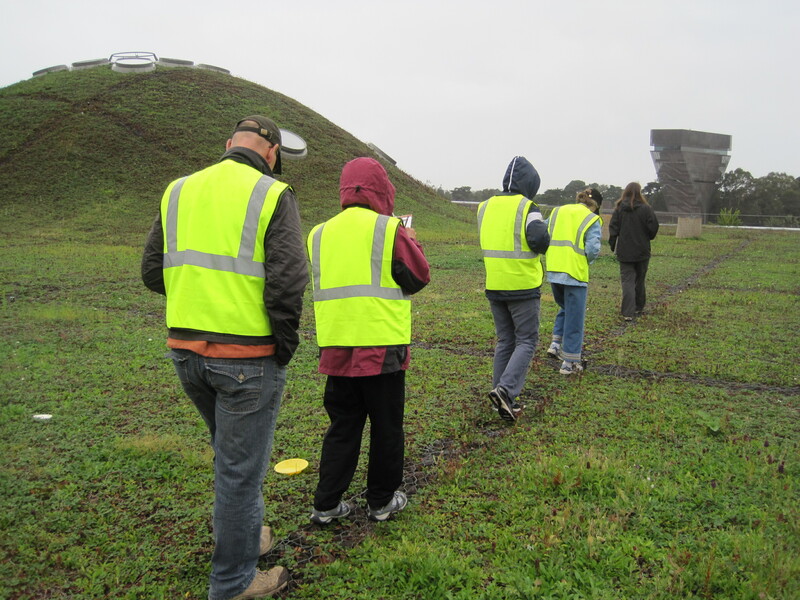 Last Sunday, braving the steady drizzle and chilly temperature, six citizen scientists took part in an on-going science project on the roof of the Academy of Sciences in Golden Gate Park. Academy Naturalist Alana Hysert oversees monthly monitoring of plants, birds and insects that are adapting to the living roof environment. She trains volunteers on what to look for and scientific procedures, then acts as knowledgeable guide and instructor during monthly sessions on the roof and keeps track of the data collected. 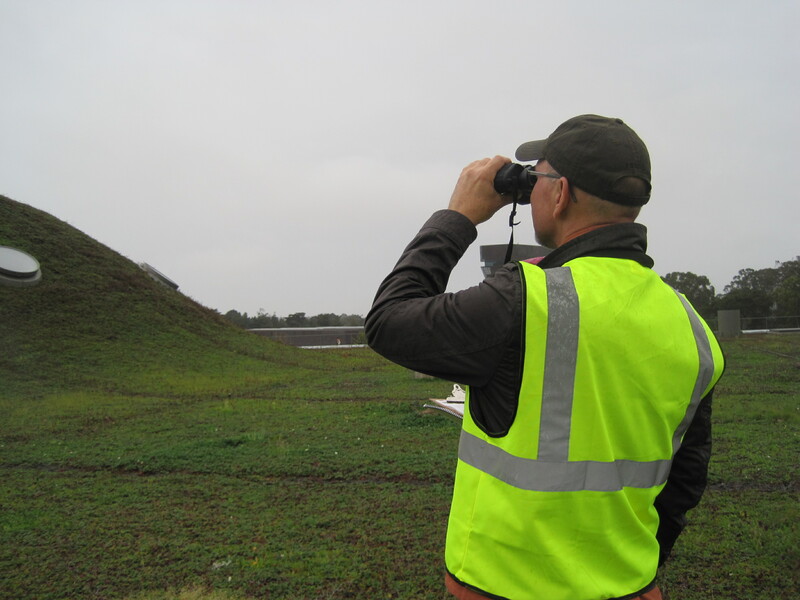 I joined the volunteers last weekend to learn more about this project first hand and I came away with a much more scientific point of view on the roof! 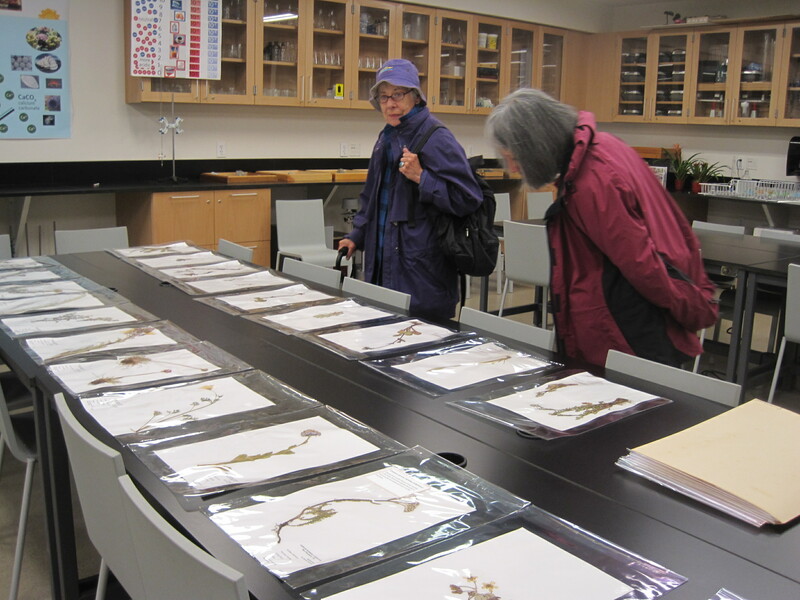 We began in the warm, dry (indoor) Naturalist Center, reviewing pressed samples of plants we might expect to see on the roof, both native species that are being encouraged to grow there and exotic invasive species that will be weeded out by gardeners. Then we donned rain gear and yellow safety vests, slung binoculars around our necks and headed upstairs. For the first hour or so we birded on the roof, calling out species and numbers as we saw them. The highlights, for me at least, were a small cluster of (5) lesser goldfinches foraging on the faded seed stalks of Prunella vulgaris ‘lanceolata,’ a major component of the living carpet that covers the roof, and a lone black phoebe perched on the roof railing. Most of the other birds we spotted flying over or in the trees surrounding the academy. Next we collected insects from traps set out on the quadrants of the roof that are being monitored. There are both surface traps (shallow dishes filled with water and sitting on the surface) and ground traps (deeper containers set into the ground). The yield included millepedes and centipedes, various flies, bees, spiders, daddy longlegs, earwigs, probably some thrips (requiring a microscope for definitive identification). 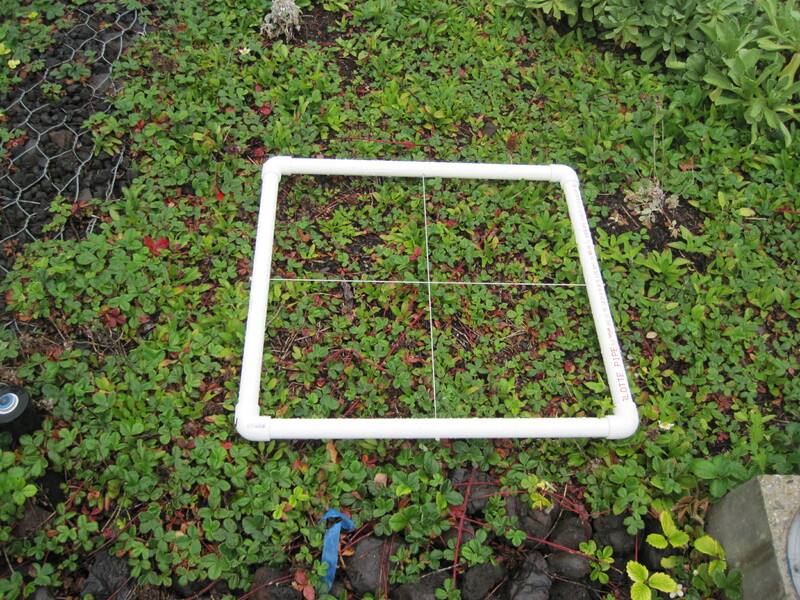 Due to the rain, we did not do the normal plant count, which would have entailed identifying and counting plant species found within a two-foot-square frame laid down at specific spots on the roof (same spots each month). Not an easy job, as the plants have grown together into a dense fabric (kind of like counting stitches on a multi-colored, patterned sweater!). Altogether it was a fascinating morning that brought home to me just how “living” that roof is! This entry was posted in california academy of sciences, wildlife. Bookmark the permalink. That sounds like a lot of fun! The description of those two-foot frames is very interesting. It makes me think of how many different kinds of native habitat exist. That one is up on a roof, and built on special containers. Those conditions will surely affect the plants and animals up there – in ways that we hardly understand. Hope that the team learns a lot!